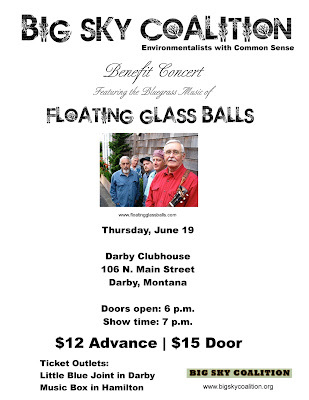 The Floating Glass Balls, a bluegrass band from Oregon, will play a benefit concert at the Darby Clubhouse in Darby on Thursday, June 19th. Doors open at 6 p.m., showtime is 7 p.m. This event is by presented by Jay Toups, volunteer webmaster on behalf of the Big Sky Coalition, Environmentalists with Common Sense. Advance tickets can be purchased at Little Blue Joint in Darby and the Music Box in Hamilton.